The sounds of Native American flute music wafted over the South Oval at the University of Oklahoma last week as the Spring Heritage Celebration Day opening ceremonies began. 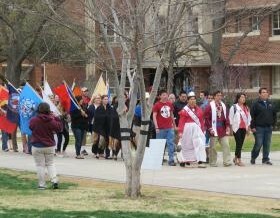 It’s also the 100th anniversary of the OU Spring Contest Powwow, making it the oldest university powwow in the nation. Native students gather at the south end of the Oval in front of Dale Hall awaiting the sound of the drum to begin their march up to the tipi erected at the north end of the Oval. The young men of the Native American fraternity, Sigma Nu Alpha Gamma or SNAG, sit around the drum and start to sing. The keynote speaker for the celebration is Clarke Stroud, University Vice President for Student Affairs and Dean of Students. Stroud likes the fact that this event is outdoors and all students can hear it. “It’s not just about our native community but it’s about any students that want to participate, honoring our native community, here with all of our students,” Stroud said. Stroud said the tipi is a visual reminder to all students that Native Americans have a place on campus. Warren Queton, a member of the Kiowa, Seminole and Cherokee Nations, helped set up the tipi. “It symbolizes different things, but not all Indian people lived in tipis, so it’s kind of a plains tradition,” Queton said. “It symbolizes to me the Native American Church, because it’s considered a church by many of our plains tribes, they go in there and they pray,” Queton said. “We try to put it up to represent all of our Indian students coming together,” Queton said. Students came up one by one to receive a blessing in the form of being “fanned off” or “smoked off” with cedar smoke. Lindy Waters, from the Kiowa and Cherokee nations, is the Director of American Indian Student Life at OU. He sees this day as an affirmation of the strength of the native students. “They’re starting to really take hold of what it means to be a leader combined with being a scholar here at OU. They really have bought into not only sharing their culture with the campus but showing them that they’re true leaders on campus,” Waters said. One of those student leaders is Julian Guerrero, Jr., a member of the Comanche and Kiowa nations. He is the president of AISA, the American Indian Student Association. It’s the largest native organization on campus. The native population at OU is what brought him to the university. Turner Wentworth Hunt , a member of the Muscogee Creek Nation, has the distinction of being Mr. Indian OU and the Cultural Affairs Chair for AISA. Hunt also found a more prevalent native community at OU. “It’s very familiar, very family like here in comparison to other things. And that helps. Even if you get so irritated with people, I mean they are like your brothers and sisters; they’ll motivate you to graduate. They are actually concerned about your grades,” Hunt said. There is a long history of Native American attendance at the University of Oklahoma, as evidenced by the OU Powwow being in its centennial year. “Well, it’s very exciting for us here, like I said, this is the 100th year and to kind of put things into context, a hundred years ago Native Americans weren’t even citizens of the United States yet, so that just goes to show the long cooperation between the University and the Native American community here in Oklahoma,” Hunt said. “Grand Entry is usually at 7 o’clock but we moved it to 6:30 because we have quite a bit of competitions and intertribals (a song that everyone can dance on), so we wanted to make sure we have plenty of time,” Hunt said. The Grand Entry is the opening to the evening festivities. Everyone involved in the powwow lines up starting with the military color guard dances into the arena. The color guard is followed by the Head dancers who are followed by any tribal princesses present in single file. Then comes in the dancers, each dance category lined up together: Women’s Cloth, Women’s Buckskin, Fancy Shawl. Then comes the men lined up according to their categories: Straight Dance, Traditional and Fancy Dance. Everyone dances into the arena with the drum pounding and the singers providing a long song, the Grand Entry brings all dancers into the arena and can take up to 20 minutes, or more. “The Grand Entry is the big event, very flashy, very showy. You have all the dancers, the students, the flags, the honor guard as well as veterans are always honored there,” Hunt said. “So it’s a pretty big spectacle and that kicks off basically the competition and intertribal part of the powwow where they invite everyone to come and join in the dance on the floor of the Lloyd Noble,” Hunt said. Dance competition awards are given out at the end of the evening. The Powwow will be held in the Lloyd Noble Center on April 12 and starts at 1:30 p.m. with Gourd Dance, supper at 5 p.m., Grand Entry at 6:30 p.m. and lasts until midnight.